So What free guitar tab and video lesson by Jeffrey Thomas. 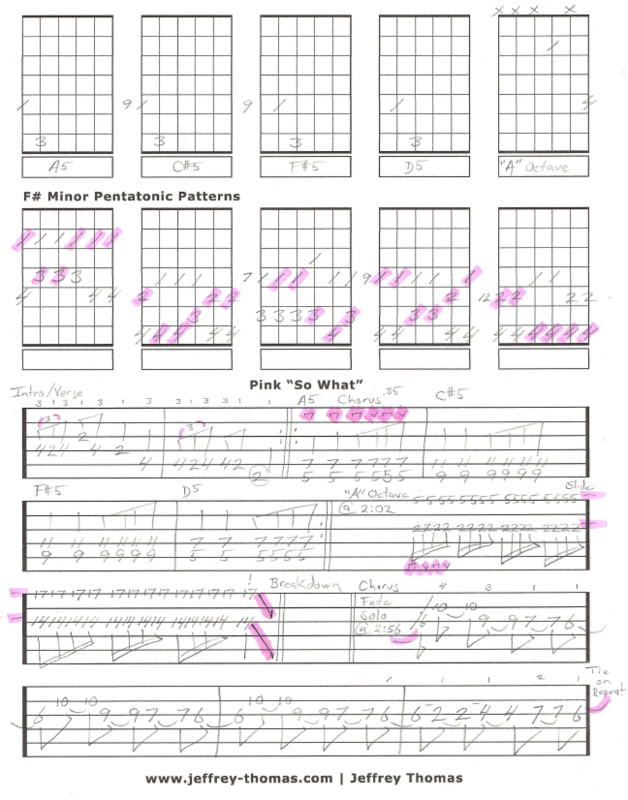 Learn to play Pink’s So What with all the signature guitar licks and song structure with my free guitar tab and video lesson. In this lesson you will learn the main guitar lick, power chords, all five pentatonic patterns for the key of F# minor the octave breakdown section and the ending solo. This is a very popular tune with my guitar students. Want the guitar tab for free? Just send in your email address using the form provided. Looking for the best online guitar lessons? Fill out the Schedule A Free Lesson form to set up your free Skype guitar lesson today! “So What” reached #1 on Billboards Hot 100 and became Pink top download song in the U.S. with sales of over 4 million downloads….must be nice. Find more free online guitar lessons on my tab, video and blog pages.